PIER members may be interested in this event 'Digital Health-The Skills of the Future' event being organised by Healthcare Businesswomen's Association in EY offices, Dublin on Thursday 22nd November 2018. Pharmacist and PIER career webinar presenter Michelle Cuddigan (EY) will be chairing the panel discussion. Linda Vittone (Vertex) ’From bench to bedside, the development of orphan medicines’. The PIER AGM will take place after the CPD meeting. To register, email education@pier.ie before Thursday 29th November 2018. PIER in collaboration with EIPG are organising a webinar on the topic of 'Data Integrity' on Tues 11th December 2018 at 4pm GMT. The speaker is Dr Alessandro Regola who has extensive experience in GMP and quality systems. The session will be chaired by Dr Piero Iamartino, EIPG Vice-President, Technical and Professional Development. Overview of Webinar: The presentation will cover the issue related to the integrity of GMP relevant data that the pharmaceutical industry has been struggling with for the past 5-7 years mainly due to violations recorded during Authority inspections to pharmaceutical (both API and drug product) manufacturing facilities. Most common and frequent compliance issues related to paper, IT or hybrid (paper+ IT) systems will be discussed. A recommended risk assessment and remediation approach will be presented, including the classification of affected system based on risk for the quality of the product and the patient health, the evaluation of the gaps and the prioritisation of corrective actions. 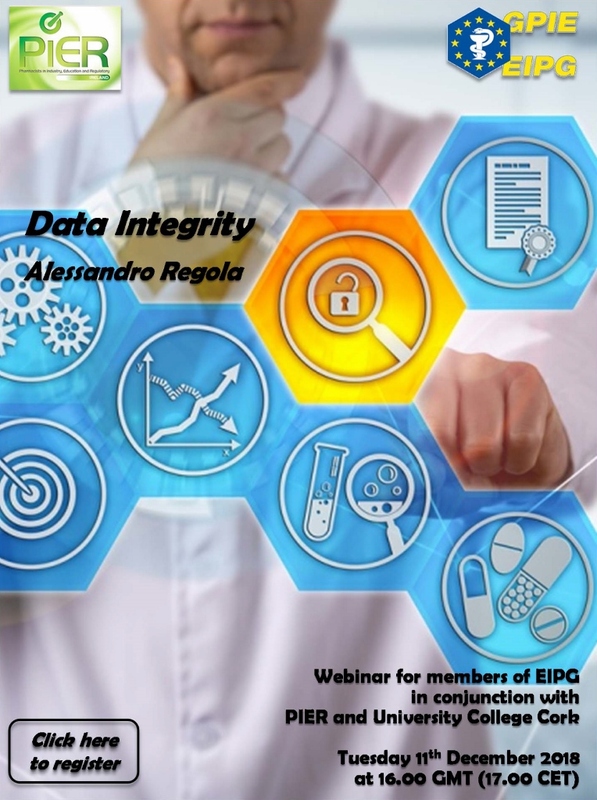 For further details on the webinar and how to register, see EIPG PIER webinar on Data Integrity_11th Dec 2018. PIER is delighted to announce that its 2018 Autumn CPD meeting & AGM will take place on Sat 1st Dec 2018 in Clayton Liffey Valley, Dublin (9.30pm-1pm). The theme of the CPD meeting is 'Insights into Rare Diseases'. Great speakers from Genomics Medicines Ireland (GMI), HPRA and Vertex will be presenting.